Former Gov. 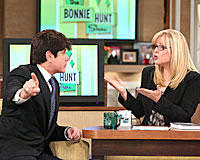 Rod Blagojevich on The Bonnie Hunt Show. Soon after Rod Blagojevich was led in handcuffs from his Chicago home in December 2008, comedian Jon Stewart of Comedy Central’s The Daily Show noted that Illinois has seen four of its last seven governors arrested (Otto Kerner, Dan Walker, George Ryan and Blagojevich). Yucks aside, what is likely to be Blagojevich’s lasting legacy in his home state? Before Jay Leno and David Letterman learned to pronounce his name, he was in office for six years, fundamentally changing politics and government in Illinois. He raised the bar for political fundraising and dramatically lowered it for political discourse and civility. He presided over a long slide into fiscal catastrophe that he arguably didn’t cause but certainly didn’t prevent. He introduced a dictionary of new phrases into the state’s political lexicon — from “drunken sailors’’ to “bleepin’ golden’’— that will be with us for a long time. Supporters, what few of them are willing to speak up these days, credit him for a progressive policy agenda on health care and other issues that was ahead of its time. Detractors blame him for nothing less than “the crippling of state government,’’ in the words of Charles N. Wheeler, director of the Public Affairs Reporting program at the University of Illinois Springfield. Blagojevich’s view of his own legacy was clear in August. When the history of Blagojevich’s impact on Illinois government is written, it will certainly contain this little piece of irony: The man accused of trying to shake down a children’s hospital did more to promote campaign finance reform than just about any other single state politician in modern times. Since January 2009, Illinois has banned campaign donations from state contractors — so-called “pay to play’’ arrangements — and next year, it will implement its first-ever across-the-board limits on campaign donations. After a generation as one of the few “Wild West’’ states that still allowed completely unfettered political donations from any source, Illinois’ campaign finance system has started to edge its way out of the 19th century. Virtually everyone involved in creating those reforms says Blagojevich’s fundraising practices and his problems, both before and after his arrest, were the driving factor. “In the end, Rod Blagojevich turned out to be the ultimate reformer,’’ says Cynthia Canary, executive director of the Illinois Campaign for Political Reform. Spurring that change pretty clearly wasn’t Blagojevich’s plan, despite his stated enthusiasm for reform when he won his first term in 2002 against a Republican Party decimated by scandal. Six years later, when Blagojevich was presented with House Bill 824, to bar political contributions from state contractors, he tried to kill it with an amendatory veto. Blagojevich’s own aggressive fundraising practices from state contractors had helped create momentum for the bill, and his dysfunctional relationship with the General Assembly by late 2008 certainly contributed to the overwhelming override of his veto (with just three opposing votes) in September of that year. Behind the scenes, his view on the matter was somewhat different, according to federal wiretaps. “Before the end of the year, right?” he demanded repeatedly of his brother and eventual co-defendant, Robert Blagojevich, in late 2008, as they discussed a pending $100,000 contribution from the race-track owner that would not be allowed under the new rules that would kick in January 1, 2009. Rep. Jack Franks, a Woodstock Democrat and a co-sponsor of the legislation, says he wasn’t especially surprised to discover that gulf between Blagojevich’s public pronouncements in favor of reform and his private machinations attempting to get around it. “That was the problem with Rod Blagojevich: What he said in public had nothing to do with what he said in private,’’ says Franks. The second wave of reform came after Blagojevich’s December 2008 indictment and his January 2009 impeachment and removal from office. After a false start, the legislature and Gov. Pat Quinn last year instituted Senate Bill 1466, which, as of January 1, 2011, will bar donations of more than $5,000 per election from individuals to any one candidate, with $10,000 and $50,000 limits, respectively, on contributions from businesses and political action committees. “The legislature clearly reacted to the story that was unfolding before our eyes,’’ says Sen. Don Harmon, an Oak Park Democrat and a lead sponsor of the legislation. Quinn signed the bill into law on December 9, 2009 — one year to the day after Blagojevich’s arrest. “Last year, on this very day, was an alarm bell ... that there (were) serious, serious problems in our state government,’’ Quinn said at a crowded bill-signing ceremony in Chicago. The tenor of Illinois politics under Blagojevich might be summed up as playground-caliber name-calling, backed by unprecedented stacks of money. Going into the first general election season since his arrest, there are indications that the tone is still echoing. Soon into Blagojevich’s first year in office, it became clear that the underside to his Clintonesque optimism was a form of vilification politics that was beyond what even seasoned Springfield veterans were used to. In autumn 2003, he stunned the Capitol political culture by publicly accusing the legislature (controlled by his fellow Democrats) of spending like “drunken sailors.’’ In 2004, he accused his own state Department of Education of being “a Soviet-style bureaucracy’’ in a speech that he delivered while his state schools chief sat watching from the audience. The targets piled up during his tenure: the business sector, state workers, Republicans, fellow Democrats, the federal government, the media. Virtually anyone who impeded or questioned Blagojevich’s agenda was fair game. “He’s found a bogeyman every year,’’ Steve Brown, spokesman for House Speaker Michael Madigan, a Chicago Democrat, said in early 2008. Madigan and his daughter, Illinois Attorney General Lisa Madigan, were among the most frequent targets. Government ground back at him. By 2004, his second year in office, Blagojevich had inadvertently introduced yet another new phrase into the lexicon of Illinois politics: “Memoranda of Understanding,’’ or “MOAs.’’ These were documents that the legislature forced Blagojevich to sign in exchange for ending the budget stalemate that year — essentially written promises to carry out what he’d agreed to do during the budget negotiations. They were the kinds of agreements that used to happen with a handshake, but lawmakers in both parties had concluded by that point that Blagojevich had systematically lied to them during the previous years’ negotiations. He had to sign 54 MOAs that year. “Can you get re-elected if you tee off all the elected officials?’’ Patti Blagojevich once asked her husband, as she relayed it to Chicagomagazine in a 2003 interview. Did he do anything right? From the viewpoint of a progressive agenda, he certainly pushed the correct buttons. His obsession with health care — especially his signature “All Kids’’ program, creating state-subsidized health care availability for all Illinois children — was arguably ahead of the curve on the current national debate. He fought for universal preschool, free public transportation for seniors, a higher minimum wage and other progressive initiatives. Not everyone was so impressed. Detractors, then and now, say many of those initiatives were gimmicky and ineffective and displayed an end- justifies-the-means attitude that ignored fiscal reality and, sometimes, legality. After Blagojevich made an epic show of flouting federal restrictions to make Canadian prescription drugs available to Illinoisans, for example, few took advantage of it. His free-rides-for-seniors initiative is costing Chicago’s public transportation system millions, much of it for riders who, critics say, don’t need free rides. Given the scope of the national economic downturn, even Blagojevich’s harshest critics would be hard-pressed to conclusively lay the state’s current fiscal mess at his doorstep. But, indisputably, his policies didn’t help forestall fiscal crisis, and there was never any indication they were meant to. One sobering mental image from the federal corruption case is of Blagojevich hiding in a bathroom to avoid having to talk with his budget chief. “While every state has suffered in the recent economic situation, Illinois’ problems were exacerbated by Blagojevich’s big spending and inattention to governmental detail,’’ says Dillard. For progressives, then, the Blagojevich legacy could end up making it harder to persuade skeptics of the sincerity of those efforts, since even many people who agreed with his stated agenda have come away disillusioned. Indeed, defenders of Blagojevich’s policy agenda are few today, even among those who agree with the policies themselves. As for Blagojevich’s own view of that part of his legacy, the federal wiretaps reveal a deep bitterness at polls that showed his reputation by 2008 was less as a progressive politician than a crooked one. Blagojevich raised unprecedented amounts of money during his tenure as governor, largely with the kinds of five- and six-figure donations from state contractors that would ultimately be outlawed, in part as a result of his remarkable success with them. In his 2006 re-election campaign, with a record $26 million at his disposal, he swamped Republican challenger Judy Baar Topinka with a television blitz that centered on former Republican Gov. George Ryan, who was by then awaiting the start of his prison term for corruption. Topinka, the former state treasurer, and Ryan had never been perceived as especially close allies, but Blagojevich’s blitz took care of that. The money-driven campaign — especially the now-infamous slow-motion clip of Topinka dancing a polka with Ryan at a political event — destroyed Topinka’s previously affable persona and nudged the unpopular Blagojevich into a 49-percent victory. “He demonstrated in his re-election the importance of outspending the opponent,’’ says Mike Lawrence, retired director of the Paul Simon Public Policy Institute at Southern Illinois University Carbondale and a top aide under former Republican Gov. Jim Edgar. There is no way to know for sure whether this year’s muddy Illinois gubernatorial and U.S. Senate races — full of guilt-by-association themes and personal-history attacks — might contain more constructive dialogue were it not for that lingering example. But for Topinka, this year’s Republican nominee for comptroller, the lesson is clear. Not everyone was so impressed. Detractors, then and now, say many of those initiatives were gimmicky and ineffective and displayed an ends-justifies-the-means attitude that ignored fiscal reality and, sometimes, legality. Kevin McDermott is Springfield bureau chief for the St. Louis Post-Dispatch. Ever the showman, Rod Blagojevich sought the spotlight with a basketful of grandiose proposals, half-baked notions and — unfortunately for the former governor — ill-conceived criminal schemes. Could it have been the scorching, record-setting heat besetting Illinois in July? Or maybe fevered anticipation of the chance to renew his downstate bona fides by cutting the ribbon to open the Illinois State Fair? Perhaps it was, plain and simple, a paranormal phenomenon. Whatever the explanation, Gov. Pat Quinn sure looked like he was channeling his disgraced predecessor on a number of high-profile, mid-summer occasions. Rod Blagojevich's lawyers laid out a final set of arguments in writing before they step before appellate judges next week to argue that the imprisoned ex-governor deserves a new trial. Blagojevich. The brief was posted late Monday. The defense and prosecution will get 30 minutes each to deliver oral arguments before a three-judge panel Dec. 13.